Understanding population dynamics is crucial to understanding current and future health care needs and designing systems to meet those needs. In this paper, we provide a methodological approach to investigate population dynamics in a system dynamics model configurable to initialise in dynamic equilibrium or disequilibrium. We then use the model to investigate how the current measured population compares to a population of the same size in equilibrium, and how a dependency ratio will change over time under different scenarios. We apply our approach to Singapore, which, like many other countries, has a rapidly increasing proportion of elderly in the population. 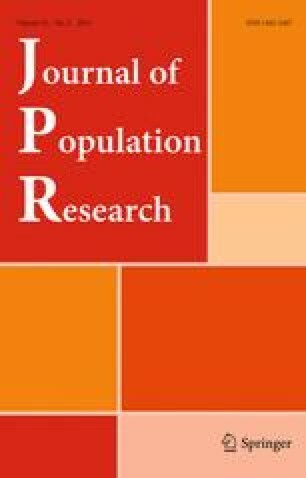 To simulate a hypothetical total population of Singapore in a steady-state, four-level model of the kind discussed in Chapter 2 of Meadows et al. (1974) the initial levels can be derived from constant mortality rates and the time of progression (maturation) from one system state to the next: Juvenile (age 00–age 14), Fecund (age 15–44), Mature (age 45–64), and Elderly (age 65+). The distinctions between age levels are somewhat arbitrary but can be changed by changing parameter values for mortality and maturation rates. The important distinction is roughly between child-bearing years, working ages, and dependent ages. Measured population data are published by Singapore Department of Statistics and include estimates made by that department. The mortality rate parameter values are drawn from data published by the same department and adjusted for simulation as discussed in Chapter 2 of Meadows et al. (1974).